My friend Dan is eight years younger than I am, lives on the other side of the world, and is the closest I’ve ever come to finding a true kindred spirit. She’s the person I ring in the middle of the night when life goes pear-shaped, as she instinctively and intuitively understands how my brain (and heart) work. I love her to bits. We have a regular “date” – we chat on the phone or over skype once a week. During a recent conversation, the topic of what we were reading came up. Dan was appalled by my current reading list, which apart from cookbooks is liberally sprinkled with dodgy romances, old detective novels and cheap self-help books (you’d think I’d have figured out by now that the books were discounted for a reason). “What would Oprah think if she came to visit?”, she asked (since moving to America, Dan has become a member of the Church of Oprah). And so, she made me buy a couple of new books. 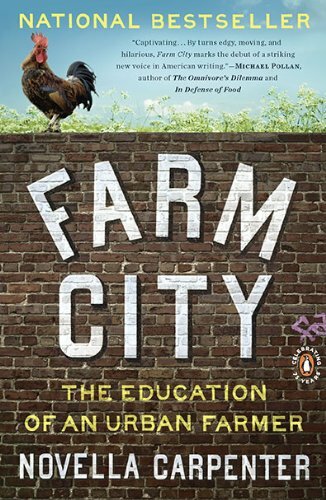 One of them, Farm City by Novella Carpenter, is absolutely brilliant – the best thing I’ve read all year. It’s about a young woman who sets up a community farm on a vacant plot of land in the middle of Oakland, California, in an district known as Ghost Town. As Wiki describes it, “the area is known for its violence and blight”. In the midst of it all, with homeless people living in cars on the street, regular gunfights and shootings, and drugs being sold out in the open, Novella and her partner Bill convert the empty lot – basically as squatters – into a thriving and productive urban farm. Her adventures go far beyond simply growing vegetables though, and vegans and vegetarians be warned, there’s a lot of livestock being grown and eaten within these pages. She starts with fowl – she raises, kills and roasts her own turkey for Thanksgiving – and then moves onto rabbits, and then pigs (in the middle of the city!). It’s a steep learning curve for both of them, and a glorious read for the rest of us, offering well written prose, humour and above all, blinding honesty. I was torn between wanting to read it as quickly as I could to find out what happened next, and not wanting the story to end. If you’re interested in Novella’s ongoing tale, she has a blog here. And if you’re after a great read – particularly if you’re interested in self-sufficiency and urban farming – then both Dan and I can highly recommend this book! Looking for a summer read (outside my usual book club fare) and this looks perfect. Hopped over to the blog too. Now looking with fresh eyes in my bedroom – what would Oprah say?!! Too funny. Here’s another title that just found its way to me yesterday… The Third Plate. I haven’t read it yet, but it is non-fiction and talks about where society is going with regard to sustainability and organic and food production for the masses. I thought it sounded interesting too. Now I have TWO books to add to my list! Thank you Celia. Oh I’m definitely in need of a good book Celia. Not that I’ve read a page since Ollie arrived but I’m sure if I had something good I’d be more inclined to read. I have to chase that one down – that sounds like my kind of read. I have a pet theory too that green spaces, gardens and productive communal gardens have a beneficial effect on people’s psyches. It makes me so distressed to see how much of this land is being covered by concrete – huge mausoleum-like temples to the merchants. But I love old detective novels – I particularly liked all of PD James’ novels. How lovely, Celia, that you have a friend like Dan that you can really communicate with. Two thoughts: have to do some homework into this – and, hope that Celi from the ‘kitchensgarden’ is reading . . . . I can’t seem to find hours in the day for reading but your new book sounds like an interesting one. An interesting must read book, but first In need more hours in my day. There was a program on Radio National…..I think? this week about a single mum doing a similar thing with her run down verge in a poor area with fairly rampant violent crime; she was amazed how much the crime rate seems to have gradually improved since she started the garden. Sounds like an interesting book. Looked at her blog. Amazing what she did with that vacant lot! As a side note, I finished reading all the IMK posts. It sure was interesting taking a trip around the world to peek into kitchens. From exotic fruits to pot stands and beautiful pictures, it was a fun trip! I’ll have to look into that book as well. My reads are mostly romance or mystery/thriller. Nice easy reads on the iPad while working out! Time to branch out I guess. This sounds like a good read! I have a young friend working in Oakland, California in an impoverished area and many of her stories are of overcomers who work through the circumstances and poverty to make life richer for themselves and those around them. Thanks for sharing that Celia. Sounds a great read and a lovely book to share with friends as well. I’ve just started reading this and I’m absolutely loving it! Sounds like an interesting one Celia. I read a few books a week and will have to check this one out. I’m laughing a little because my sister in law is one of these well off do-gooders always looking for a cause and has decided to start a community garden in her town. Hardly like the area described in this book and I doubt anyone within walking distance needs free produce. So her biggest dilemma seems to be “what if someone who’s not poor takes some vegetables?” Ponder that one from a few different angles from location to the potential end of the world as we know it if someone grabs a zucchini that they could afford to pay for…are you shaking your head with me Celia? on June 6, 2014 at 9:35 pm Platanos, Mangoes and Me! You sound like me with the cookbooks and my detective novels…Will pick it up over the weekend.